We're always looking for new ways to enjoy vegetables, and there are so many people who will avoid broccoli at all cost, but it doesn't have to be this way. 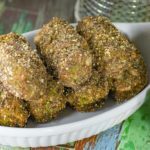 These Low Carb Broccoli and Bacon Croquettes are bursting with delicious bacon and cheese, and still providing those essential nutrients from the broccoli - you can barely even tell it's there. Boil or steam broccoli for 5 minutes, or until tender, Drain well. 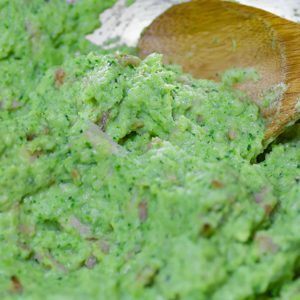 Blend the warm broccoli with the butter into a puree. Place into a bowl and stir through the grated parmesan, pepper and salt. Dice the bacon into small pieces and saute over a low to medium heat for 6 to 8 minutes. The bacon fat will render whilst the bacon browns, add the bacon and fat to the broccoli and mix well. Chill the broccoli and bacon mix for at least 30 minutes. Turn your deep fryer to 350F/180C and allow to heat up. After the mix has chilled, add the egg and ground up pork rinds and mix well. Roll the mixture into 14 small barrel shapes. On a plate mix together the almond meal and flaxseed meal, roll each croquette through this dry mix and ensure each side is coated, pressing the mixture onto the surface of the croquette. Deep fry your croquettes in batches, ensuring you don't overcrowd the fryer. They will take around 3-5 minutes, remove when crisp and golden brown. Enjoy!